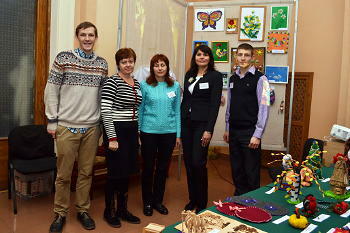 Chernobyl home page (stories about the "Revival Centre"
"I really enjoy working with children. Their smiles make me happy. In such moments you understand the most important human values - in the midst of doing good." I profess faith, which is surrounded not by a halo of saints or prophets but just happy people. -- Lina Kostenko "Journeys of the Heart"
Recently in our society we’ve had a large number of social, cultural and economic changes that have not only made a positive impact, but have also increased certain social problems. In part, this situation is solved through the work of volunteers. First, consider the inherent meaning of the word “volunteer.” Official sources define volunteer as a person who voluntarily, without pursuing useful purposes, engages in activities for the benefit of society, not in exchange for monetary compensation. In fact, the word "volunteer" incorporates much more. A volunteer is primarily a person with a big heart, a person who knows how to help others understand other people's problems, able to inspire hope and faith to those who fall in spirit. We know of such a man, a young American by the name of Colin Kubik who for ten months has been on a volunteer mission at the “Revival” Rehabilitation Center. Our Centre has experienced such cooperation and has always supported the aspirations of volunteer workers assisting our employees. In 2013, Jennifer, a citizen of Great Britain provided volunteer help in the rehabilitation of children with disabilities for nine months. For three years in a row now, Anglia Ruskin University students have come to the Centre, implementing a special volunteer program lasting two weeks. Family heritage is a very important incentive for young people who want to work as volunteers - grandchildren or children of foreign benefactors who have made considerable contributions to the development of our rehabilitation center. Colin Kubik is a nephew of our old friend Victor Kubik. Thanks to the sponsorship assistance of Victor and his family at the Centre, we have new facilities and modern equipment. 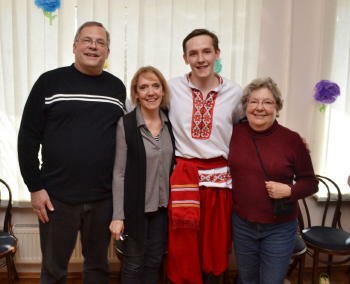 So, in July 2015, maintaining the tradition of his large family, Colin Kubik came to Ukraine with a great desire to do good. 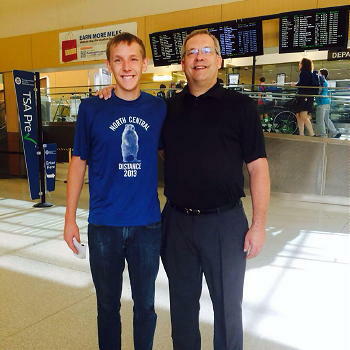 Today, Colin is a member of the big family of the “Revival” Center. Children love him. Parents of sick children respect him. And workers are simply delighted by his diligence, sincerity, openness and friendliness. "How did I get here? The history goes back 10 years, when I was in fourth grade. My uncle Victor came to our city Spokane, Washington and addressed the students of my class. He talked about the disastrous Chernobyl nuclear power plant explosion. Frankly, I do not remember much about his stories, I just knew that my uncle helps those affected by this tragedy. I am very fond of his work - helping people around the world. "It took 6 years before I had the opportunity to visit Ukraine. Why does Ukraine attracts me? First, I have Ukrainian roots. My grandmother was born near Kharkov and my grandfather in the Ternopil region. During the Second World War, they were forcibly deported from Ukraine to work in Germany. That's where they met. After the war, they did not return home because of Stalin's regime. They were afraid to be exiled to Siberia. But, now knowing what would await them and not knowing the language, they were able to come to America. 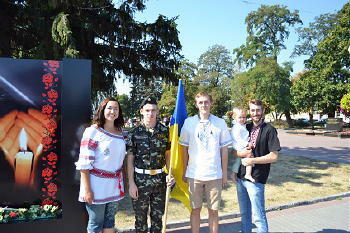 "During my first visit to Ukraine, I, along with other Americans worked in a camp as volunteers. For two weeks we helped orphans in Vinogradov in Transcarpathia. I also visited my relatives in Dubno. On my return to America I knew that I had to go to Ukraine again. Ukraine won my heart. 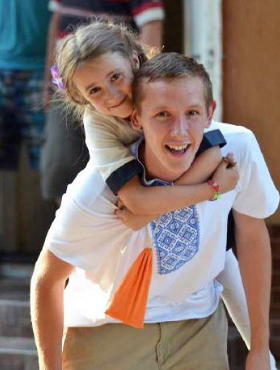 "Every summer I returned to the camp in Ukraine to work with children. But, two weeks was not enough. I was looking for a way to remain for a longer period to continue in a mission to help people. "In America I attended college, worked as a waiter and in a sports health club. I worked hard and collected a small amount of money. I did not want to spend money on education, not having determined what I wanted to be. The dream to return to Ukraine did not leave me. Uncle Victor and I talked a lot about the “Revival” Center and the possibility of coming to this place. That's when he contacted the director of the Center Vasily Ivanovich Pasichnyk and asked if I was able to work there for six months. When that was agreed upon, I began preparing for the trip. People often discouraged me, saying that I lost my mind because of the war in Ukraine. "I arrived on July 22, not knowing much of the language and not knowing what awaited me in Chernhev. On the first day I met with the staff of the Centre. I consider myself shy, not decisive, and frankly, it was very difficult to get used to. "From the day I became a volunteer, I really enjoyed working with children. Their smiles make me happy. I am still a child myself and want to say that the child in me probably will never grow up. "Every day, while working with children and staff, I cannot not smile. I get great satisfaction from the fact that I can help them. No material things are as pleasing as these children’s smiles. In such moments you realize that the most important human values ​​are in the doing of good things. "My parents and grandmother came in March to visit me. They were very impressed by the Center and the important work that is done here daily. "Incidentally, one of the most memorable events of my stay in the Centre was the celebrating my 21st birthday in the circle of the children and fellow workers. It was a very fun day! I would not want to be anywhere else other than with these kids, This is where I belong. "I am often asked, "Why do you want to be with the children?" 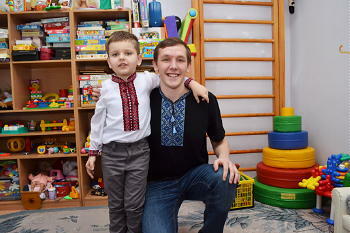 I reply "I came to Ukraine to make it easier for the employees who work with the children. With my help it will be eaiser for the employees and parents. I perform various tasks. In the morning I work in with the rehabilitation groups where I am an assistant teacher. "After lunch I usually go home and have free time, but sometimes I work all day. Besides the rehabilitation sessions I am invited to different offices and activities. In the sewing area I cut shapes from cardboard boxes. In the computer area I help children acquire new computer skills and use the Internet. I also chief photographer at the Centre. When guests arrive or there are various celebrations with children, I take and edit the photos. I have taken several thousand now. I like to feel needed. "I want to say a few words about the staff at the Centre. If one word could describe them, the word would be "love." Here I feel love and I see it every day, in every corner. If there was no love, there would be no Centre. I see how they give solace to children and parents and I see how they support them. Because of love this is possible! "In June I return to America, where I will continue my education. I now know my future profession - teacher of " challenging " children. For this I need another two to three years of study. I speak Russian well now, but want to learn the language of my roots - Ukrainian . Watching Colin during his contact with children in the Center, you experience many emotions. We noted his openness and sincerity, gentle and caring attitude to children. You understand that adolescence is a great time to form thoughts about a young person’s future. Colin took the opportunity to try and find himself, acquire necessary positive values, feelings, attitudes, thoughts and desires. He is an example for many of us.